If you’ve ever tried to give your dog a drink from your water bottle, then a collapsible bowl is likely to be high up your priority list when you’re out and about with your dog. As they’re pretty cheap, it’s worth buying a few bowls that you can keep permanently with your camping and hiking gear so you don’t risk leaving them behind. This four-pack of collapsible silicone bowls from PetBonus would suit smaller dogs and the handy carabiners allow you to clip them to your belt or backpack. Larger dogs may be better off with this water and food bowl set which has a larger water bucket. Dogs love being able to run around outdoors, but if they’re getting more exercise than normal, you’ll need to pack some extra food. Dried food (kibble) is preferable to wet and only put out what your dog will eat as leaving food lying around could attract unwanted wildlife. If you’re backpacking and looking for a lighter alternative to your dog’s regular food, you can also buy freeze-dried dog food. Doggy treats are great for bribery rewarding good behavior around the campsite. Stock up on your pooch’s favorites or make some homemade trail treats. Some dogs will happily curl up on the ground (or your feet?) but if you want to protect them from cold or damp surfaces, you’ve got a few different options. A cut-down foam sleeping mat is cheap, lightweight and easy to strap to the back of your pack if you’re backpacking. Padded beds such as Chuckit!’s Travel Dog Bed are rather like oversized cushions. They’re great for providing somewhere soft for your fur baby to lie, and they’re machine washable, but if the ground is cold, you may want another insulating layer underneath. Alternatively, you could go for a raised bed like this HDP Elevated Napper which folds up like a camp chair. This is a great option for older dogs or those who feel the cold, particularly when you use it in combination with a sleeping bag. When the temperatures drop at night, you rely on your cozy sleeping bag to keep you warm. And while your pooch might try and wriggle their way into your bag, you’ll both sleep more comfortably if they have their own sleeping bag. Letting your dog run around a campsite is not cool. In fact, most campgrounds will require you to keep your dog on a leash at all times. But if you’re trying to cook or do other tasks, you don’t want to be juggling your four-legged friends at the same time. A heavy-duty stake that you can secure your dog’s leash to is the simplest option, but if you’re camping on stony ground, you may struggle to get it deep enough into the ground. Another option is to create a cable run between two trees, like you can see here as presented by our friends at "You Did What With Your Weiner". Make sure you use wide webbing fabric or similar around the trees, as thin wire will bite into the bark. If you’re looking for a solution to secure multiple dogs so they don’t get tangled around trees or each other, Alpine Outfitters provide custom-made picket lines for up to 16 dogs. One alternative to tying your dog up is to use a portable pet pen. This gives them a bit of space to move around and they can’t tangle themselves in their leash. It’s always worth bringing a first aid kit when you’re camping, but don’t forget about your dog! You can either buy a ready-made pet first aid kit or add a couple of dog-specific items, such as bandages and paw protectors, to your human kit. A dog pack gives your pooch an extra workout and lightens your load if you’re backpacking. Just make sure you build the weight up slowly and don’t overload them. The Mountainsmith K-9 Pack and the Ruffwear Approach are both highly-rated packs that have plenty of capacity for bulkier items such as a towel or water bottle. If you’re not sure how your dog will take to wearing a pack, the Outward Hound Daypack is a budget-friendly lightweight pack that you can trial before deciding whether to invest in a more robust pack. If you’re camping in cold or hot weather, your furry friend may need a bit of help regulating their body temperature. There are lots of jackets out there for different breeds of dog, and you’ll probably have your own favorite brand. If you’re looking for a lightweight layer, the Gooby stretch fleece vest is a great option or for full-on winter conditions, check out the Hurtta Summit Parka. Hot weather poses a completely different problem. Cooling vests are designed to keep your dog cool even when they’re exercising. You soak the vest in cold water and as the water evaporates, it has a cooling effect, similar to how sweat cools our bodies. Don’t lose sight of your dog in the dark. A small LED light or collar will make them visible to you and other people on the campground or trail. Microfibre camping towels have long been a part of every backpacker’s gear list. They’re packable, lightweight and dry quickly – much more practical than lugging around your fluffy bath towel from home. If your dog has a tendency to make a beeline for the nearest lake, river or muddy puddle, then a towel is essential for drying them off before they run into your tent. Just make sure you choose different colors for doggy and human towels! Although you’re likely to use many of these items on a day to day basis, it may be worth buying duplicate items so you can keep them permanently with your camping kit. 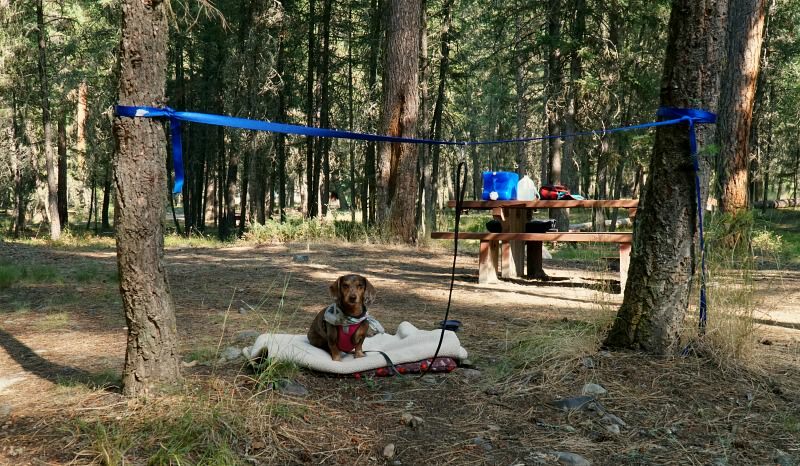 If you’re looking for more tips on taking your four-legged friends camping, check out our guide on How to Camp with Your Dog.